Over 800 friends and supporters came together to remember, honor, and pay tribute to the life and legacy of Ruth Bancroft. A special thank you to our volunteers, guest speakers, and musical performers who helped make it a wonderful day honoring our beloved Ruth. 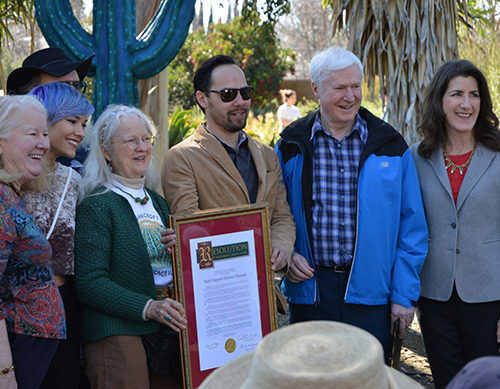 Pictured right, Assemblywoman Catharine Baker in conjuction with Senator Steven Glazer and Assemblymember Tim Grayson, present Ruth Bancroft’s children, grandchildren, and family with a Resolution of Memorium at Ruth’s Celebration of Life. Garden Curator, Brian Kemble, shared fond memories of Ruth and speaks about her courage and tenacity in creating a beautiful dry Garden that will be enjoyed by the community for years to come. Many thanks to former Executive Directors, Richard Turner and Becky Harrington, for sharing beautiful tributes to Ruth. Thank you also to James Brayton Hall, President of the Garden Conservancy, for sharing kind words about Ruth and her magical garden. A portion of the band Ancestral Water, Doug Martilla, Barbara Miercke and Jack Grady O’Neil, along with 4 members of St. John Vianney Catholic Church’s Choir, Therese Gorman, Mariae Tumelty, Sigrid Jarrett and Lydia de la Cruz, performed three American Gospel Songs in memory and tribute to Ruth Bancroft. They played “Amazing Grace”, “Swing Low Sweet Chariot” and a custom version of “Will the Circle Be Unbroken”. The custom version’s verses were rewritten by Jack and Barbara and include images of Ruth’s life and her commitment to her life’s work and her Succulent Garden. Click here to read the lyrics to “Will the Circle Be Unbroken” dedicated to Ruth Bancroft. Ruth was born in Brockton, Mass. to Torsten Petersson and Ruth Nelson Petersson. She came to Berkeley, California as an infant because her father got a teaching post at UC Berkeley as a classics professor. Ruth grew up in the intellectual milieu of her parents’ university friends. Ruth mainly attended private schools in Berkeley and then UC Berkeley where she studied architecture. When the stock market crash eliminated any chances of employment for female architects she changed her major to home arts. She found work teaching high school in Merced. In 1939 Ruth married Philip Bancroft, Jr. and moved to his family’s farm in Walnut Creek where they grew walnuts and pears. There they raised their three children, Peter, Nina and Kathy. Ruth was a collector. In the 1950s she collected sea shells. Her collection was meticulously documented: the shell’s Latin name, where and when it was collected. A few years ago the Academy of Sciences in San Francisco accepted a large part of her collection because it was so well documented and shows how the animals have changed location and size over the past 60 years. Ruth’s collecting then expanded into plants. Ruth always loved plants and was a gardener in her home growing up in Berkeley. She continued to have her own garden in Walnut Creek, growing fruits and vegetables as well as a rock garden, many roses and hundreds of varieties of iris. By the late 1960s, with property taxes increasing every year, the farm had to be sold. By this time Ruth had begun to amass a large collection of succulents most of which were in green houses or under shelter. The garden was being watered by moving around hoses with sprinklers on their ends. An orchard near the house had to have the trees removed because of disease, and Phil offered the land to her for a new garden that would have a sprinkler system and save her a lot of work. Ruth was an artist. The family has beautiful clay sculptures she made when she was younger. Her artist’s eye, along with her architectural training, allowed her to design the beautiful beds in her garden. Her garden is more than a beautiful collection of as many rare and unusual succulents and cacti as she could acquire. It is a resource for xeriscape and plant hardiness information. 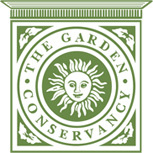 Her garden was the inspiration for the formation of the Garden Conservancy to preserve exceptional gardens. It is this garden that has now become the world famous Ruth Bancroft Garden. Ruth was predeceased by her husband Philip, her sister Doris Dillon and her brother Robert Torsten Petersson and her grandson Joseph Dickerson. She is survived by her children Peter Bancroft and wife Barbara, Nina Dickerson and husband John, and Kathy Hidalgo and husband Loreto and grandchildren Kris Hidalgo, Kim Hidalgo, Erika Hidalgo, and Philip Dickerson and wife Truc. Ruth’s legacy lives on through her Garden and through the countless lives she has touched. Please consider a donation in her honor.